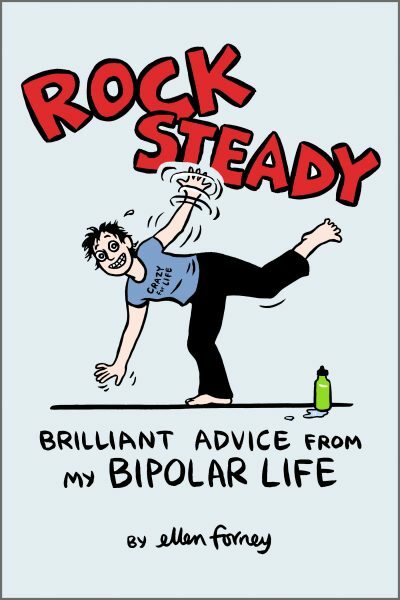 Fantagraphics has announced that they will be publishing Ellen Forney’s next book, Rock Steady: Brilliant Advice From My Bipolar Life. It’s termed a “graphic novel/self-help book” and a companion to her previous graphic memoir, Marbles: Mania, Depression, Michelangelo, and Me. I really liked Marbles for exploring how to balance artistic creativity with treatment of a misunderstood mental condition. Rock Steady continues in that vein, portraying Forney’s advice and stories about maintaining stability. Rock Steady, “a survival guide of tips, tricks and tools by one of Seattle’s most celebrated cartoonists”, is due out in 2018. I love Forney as a writer and artist, and Marbles is my #1 book to explain bipolar to neurotypical friends and new cyclers alike. I hope my confidence is rewarded with Brilliant Advice.